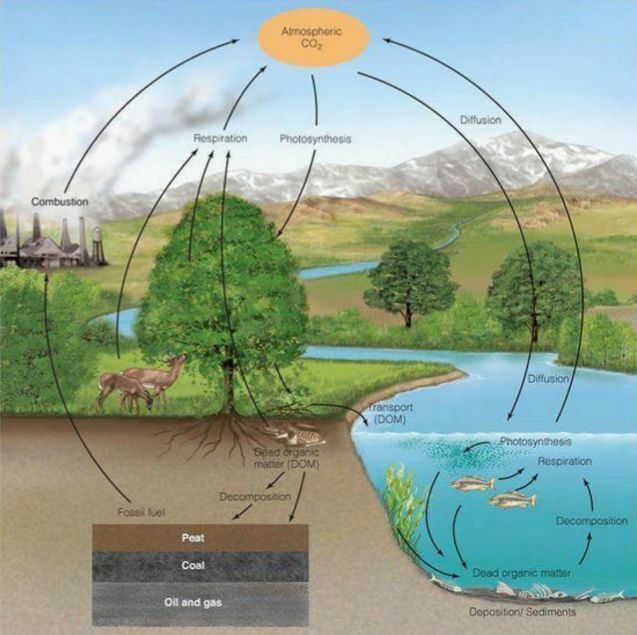 The Carbon Cycle. Hunter College. Manhattan, USA. Native forests remove carbon dioxide from the air more effectively than anything else on land; they make and ‘catch’ rain and they moderate temperature. (Pan, 2011; Reich, 2013, Carlowicz, 2012; Andrich et al. 2013; Macalpine et al. 2016). Given the real and present dangers of climate change, it doesn’t get much more helpful than that. All vegetation absorbs CO2, but very big, long-lived plants (trees) do it best because they sequester, or absorb, more carbon, and then, importantly, they store it for long periods of time (Aus Chief Scientist). Little, short-lived plants that are eaten or decay quickly release the carbon they have sequestered too soon to be of much use as climate change mitigators. Old, biodiverse forests are the best carbon stores on land (Carlowicz, 2012; Mackey et al., 2009). The world’s forests are estimated to have been absorbing around 30 per cent of all the human emissions of CO2 since 1990 (Pan et al., 2011; Reich, 2013). That’s the equivalent of the emissions from all of the world’s cars and trucks. It is widely accepted that forests play this important role in carbon storage. What has been contentious is whether old forests store carbon best when left alone, or when logged and regrown. The science now shows that they do it best when left to breathe and grow. The argument that the ‘sustainable use of wood products has the greatest climate benefit’ rests on two wonky pillars. Firstly, the argument goes that when trees are cut down and made into furniture and other products those products go on to safely store the carbon. Secondly, they say, the regrowing forest quickly sequesters and stores similar or even greater amounts of carbon, making the whole exercise climate positive. Neither of these statements is true in the Australian context. In Australia the significant majority of the wood logged from native forests each year is burnt on site in post-logging ‘regeneration burns’ and used in low value products with very short carbon lifespans – principally paper, firewood and charcoal. A 2014 study in the montane ash forests in south-eastern Australia found that only 4 per cent of the forests carbon had been stored in products with lifetimes of 30 – 90 years and that logged forests stored only 55 per cent of the carbon that old growth forests stored (Keith et al. 2014). In WA, between just 10 and 15 per cent of all the wood sold by the State’s logging agency becomes sawn timber for furniture and building each year. One study (Roxburgh et al., 2006) of seventeen forest areas showed that it takes an average site 152 years to reach 90 per cent of its carbon carrying capacity (CCC). In Australia, forests are logged a second time long before they get to 152 years old – in WA the rotation is 80 – 100 years. There are two issues here: we need climate change mitigation now, not in 152 years time, and secondly, forests that are cut down now will not have time to reach their CCC before they’re logged again. So, What are the Policy Implications and How Can We Make Money from Protecting Native Forests? Climate change is the principal threat to the natural environment, food and water security and our way of life. We are already experiencing significant changes to the climate, and catastrophic changes are predicted within our lifetimes. We must stop burning fossil fuels and protect and regrow forests as a matter of urgency. Protecting forests does not give us a license to keep burning fossil fuels because the bio-carbon in vegetation cannot absorb and store all of the geo-carbon released when we burn coal, oil and gas. But, protecting forests is a key part of the equation, and protecting them brings with it many other ecological, cultural, social and economic benefits. The Federal Government is now committed, under the Paris Agreement, to reducing Australia’s emissions by 26 – 28 per cent below 2005 levels by 2030. And we need to aim much higher than this to make a responsible contribution to keeping the global increase in temperature below 2 degrees centigrade (let alone 1.5) and therefore avoid catastrophic climate change. To achieve this, a wide range of measures needs to be adopted, not least of them being no new coalmines. The Paris Agreement commits the parties to ‘take action to conserve and enhance sinks and reservoirs of greenhouse gases, […] including forests (Paris Agreement, 2015). The Sustainable Development Goals (agreed September 2015) encourage the implementation of sustainable management of forests and to ‘halt deforestation, restore degraded forests and substantially increase afforestation and reforestation’ (Sustainable Development Goals, 2015). Prime Minister Turnbull has stated that, ‘it makes economic, social and environmental sense to protect and restore forests’ (Turnbull, 2015). While it is established that forests play a role in the climate, it mustn’t be overlooked that the climate affects the forests. To maintain forest cover and vitality, and prevent ecological collapses such as we saw in 2011 in the northern jarrah forests, we need to keep climate change below dangerous levels. Native forest logging is a significant carbon polluter and stopping logging in native forests could automatically achieve 50 per cent of Australia’s Kyoto Protocol commitment to reduce emissions by 5 per cent by 2020 (Lindenmayer and Mackey, 2015) but the target is far too low to have a meaningful impact on climate mitigation. We need to both safeguard sinks and reduce emissions. The Prime Minister is right when he says that protecting and restoring forests makes economic, social and environmental sense. Protecting native forests would safeguard a significant carbon sink, reduce emissions and mean that State Governments would no longer have to subsidise a failing industry. It might seem impossible, but all around Australia the native forest logging industry is operating at a loss and is being subsidised by State Governments. It’s true though that the state wide or national economic implications of industry restructure and climate action aren’t the only consideration. We must also take account of the regional implications. The reason that native forest logging continues to be subsidised, presumably, is a political inertia around employment in small regional towns, even as the job numbers dwindle and the industry becomes less and less viable. Socially responsible policy needs to consider how native forest protection will affect the relevant regional towns and assist remaining employees in finding realistic alternative employment. Forests For Life takes this seriously and our plan has focused closely on economic and social considerations. Read more about our plan and the economic and employment sections on this site. 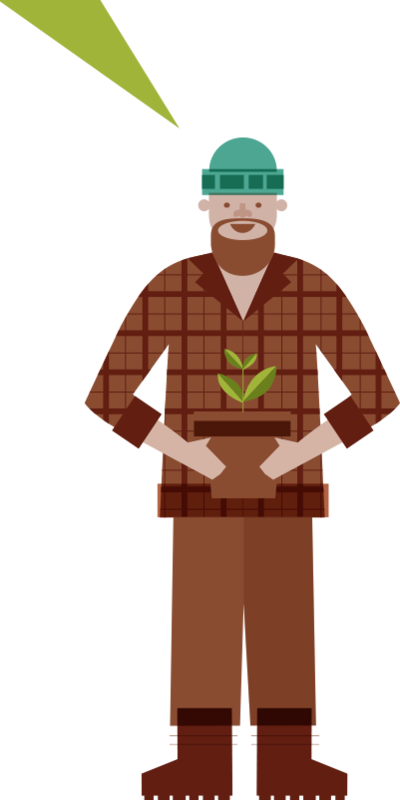 In this section we look at how native forest protection can generate income for Western Australia. All things considered, the simplest, most effective and climate friendly approach would be for the State Government to negotiate an agreement with the Federal Government based on the national climate mitigation benefit to be gained from protecting the State’s forests. The first step is to agree on a method for measuring forest carbon stocks. Weighty assessments of the carbon value of Australia’s native forests have been done and we know that many millions of dollars in carbon payments stand to be earned in each State (see list of Australia’s Forest Carbon Value papers below). The Federal Government would then provide WA with the finances to protect its forests as a biodiverse carbon store and complete the transition of the timber industry into sustainably managed plantations and farm forestry. Funds would also be used to establish a strategic approach and management plan as well as to employ administrative and field staff to conserve and maintain intact ecosystems and restore biodiversity in degraded forest areas. The NSW Government has reportedly already asked the Federal Government to develop a methodology to measure avoided emissions from forest protection. The WA Government should support this call and be prepared to act quickly to benefit from such an opportunity. Andrich, M. & Imberger, J. 2013 The effect of land clearing on rainfall and fresh water resources in Western Australia: A multi-functional sustainability analysis. International Journal of Sustainable Development and World Ecology. 20:6, 549 – 563. Sustainable Development Goals (September 2015), Article 15.2. Climate change is the principal threat to the natural environment, food and water security and our way of life.